My journey down the rabbit hole started with this fact: “The global fashion industry is the second most polluting industry in the world.” You’ll hear this repeated at panels, on blogs and news sites, and anywhere else sustainable fashion is being discussed. Intuitively, it sounds true. We’ll start with the fact that an estimated 50 million tons of polyester — a petroleum product — were produced in 2015. Growing cotton, especially if it involves pesticides, herbicides, and oil-powered machinery, is also a large carbon emitter (though not as large as polyester). And then there is the journey the multiple components of one garment take around the world on oil-gulping ships to be spun in one country, then sewn in another factory powered by coal and generators, then finished in yet another, buttons and zippers from another continent, packaged, and shipped to stores, briefly worn, tossed into the landfill (which emits the potent greenhouse gas methane), or shipped back around the world to secondhand markets. Oh, journalistic hubris. Someone had it bad after publishing what they hoped would be the death blow to the oft-cited “fact” that “fashion is the second most polluting industry in the planet." I found no basis for this fact, no research, no compilation of data. The problem is, we had no fact to replace it with. All we could say was that we had no idea how bad fashion is for the planet, and we desperately needed research to ascertain that figure. Well, the universe (or rather, the Danes) has provided. The Global Fashion Agenda, which is currently putting on the Copenhagen Fashion Summit, teamed up with the Boston Consulting Group to do some serious number crunching and put out the Pulse of the Fashion Industry Report. It’s a deep, deep dive into the fashion industry’s sustainability metrics, and makes the strong business case for better resource management by fashion companies – innovate or die, as it were. The report came up with its numbers for carbon emissions, chemical usage, and water usage by building on the Sustainable Apparel Coalition’s Higg Index, which provides a framework for brands to measure their own supply chain impact. That data was extrapolated out through expert interviews and weighting by company size and price positioning. Is fashion the second most polluting industry globally, as everyone always says? The report says that the fashion industry is responsible for the emission of 1,715 million tons of CO2 in 2015, about 5.4% of the 32.1 billion tons of global carbon emissions in 2015. (I’m going to caveat this next part to say that for global industry numbers, I’m working off of global greenhouse gas emissions, not carbon emissions. So we need to assume that the proportion of other gases – methane and nitrous oxide – is the same in fashion as it is for other industries, which it should be, because fashion is made up of these other industries). TLDR; My calculations put fashion, as an industry, as less polluting than electricity and heat (24.9%), agriculture (13.8%), road transportation (10.5%), and oil and gas production (6.4%), and equal to livestock (5.4%). That makes fashion tied for the 5th most polluting industry in the world. It’s the sixth, if you break electricity and heat production into its commercial and residential sectors. That is still really high, as one industry, but it doesn’t have quite the same ring to it. What is bizarre about doing this sort of analysis is that the fashion industry involves all the industries I just mentioned. Electricity (often from dirty sources like coal and diesel generators) powers the garment factories. Cotton is an agricultural product. A small portion of clothing’s journey is done by road transportation. Polyester is made from plastic, which is a petroleum product. Leather is a byproduct of livestock raised for food. Which just reaffirms the power of fashion. If you could fix fashion’s supply chain and lower its emissions, you would be lowering the emissions of the four most polluting industries on the planet. Fashion, could in fact, save the world. 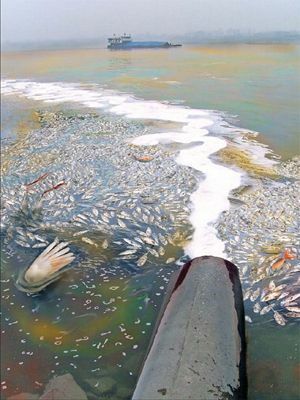 Sometimes I see the pollution fact as related to water pollution. Unfortunately, the report did not talk about water pollution, but water consumption. So let’s start with that. In 2015, according to the report, the global fashion industry consumed 79 billion cubic meters of water, which is an enormous amount, more than electricity production, and is threatened by water shortages in cotton-growing countries. But that represents only .87% of the world’s 9,087 billion cubic meters of water used per year. Seventy percent of global water usage goes toward agriculture, which includes cotton, but also just food production. (Meat consumption accounts for 30% of the average American’s water footprint.) About 20% goes to industry. Twelve percent goes toward household and municipal use. What can we take away from this as consumers? Perhaps that the industry does need to address fashion’s water consumption on a broad scale. But as a consumer, you’re better off reducing your meat consumption, especially red meat, if you are concerned about water, rather than fretting over your cotton garments. But to address the water pollution facet, fashion is not likely the second most polluting industry. Agriculture is at the top. (I’m excluding inadequate sanitation, because I’m not sure if one would consider pooping an industry. But that surely is a huge source.) Then there’s mining, which is another huge contributor. Also, the collective runoff from ground transportation. So that puts fashion in at least fourth place. That’s not to say this isn’t important to address, as the documentary RiverBlue, makes clear. 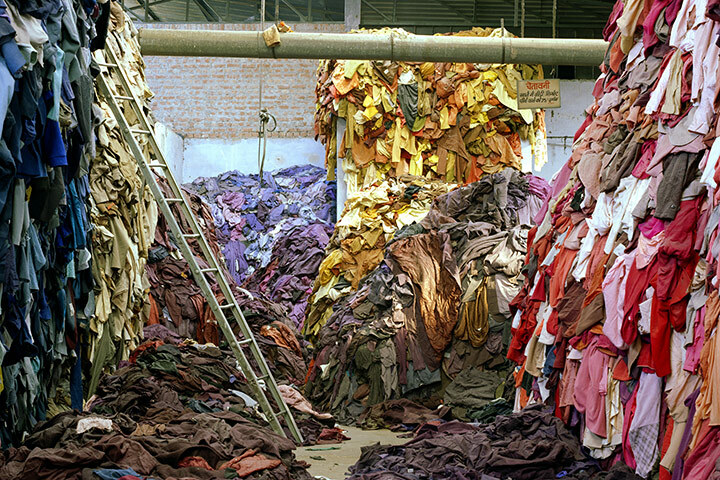 Fashion production is incredibly toxic, from the processing of fibers, to the dying, and the leather tanning. But this is not where that fact comes from. According to the report, fashion is responsible for 92 million tons of solid waste per year globally, representing 4% of the 2.12 billion tons of waste we dump globally each year. That is more than toxic e-waste, and more than twice as much as supermarkets toss in food waste. Much of it comes from the cut-and-sew process, where the shape of a t-shirt is cut out of a square cloth, and the rest is discarded. In NYC, for example, the amount of commercial textile waste is 40 times larger than consumer textile waste. It’s probably orders of magnitude larger in Asian countries in which garment exports dwarf other exports. I have been scouring the internet looking for any reliable figures on global solid waste generation by industry so I can compare fashion, but have come up empty handed. Even mining, the industry that blows the tops off of mountains, I found, has no global figures. One thing I did learn is that solid waste generation rises with an increasing urban population and wealth. In other words, globally, as we move to cities, go to work at factories and other jobs that are not agrarian, and consume more things, our waste output rises. Fashion is in there, along with convenient packaging and disposables. In any case, 4% of global solid waste is a huge amount, even if it doesn’t make fashion the second largest source. And it points to the dire need for the fashion industry to figure out a way to recycle textile waste not just when consumers are done with their clothes, but at the factory level as well. Now that we know that fashion is the fifth most polluting industry when it comes to carbon emissions, that shouldn’t make us feel complacent. Instead, it should spur us to further action. Consume less new, conventional fashion. Buy secondhand whenever you can. When you have to buy new, buy it from a more sustainable label that uses organic, natural, or recycled fibers and manufactures in a country that uses more renewable energy in energy efficient factories, such as Europe, some Latin American countries, North America or, increasingly, China. *In carbon emissions. Doesn’t include methane, which is more potent than carbon and is a large portion of livestock’s greenhouse gas emissions.